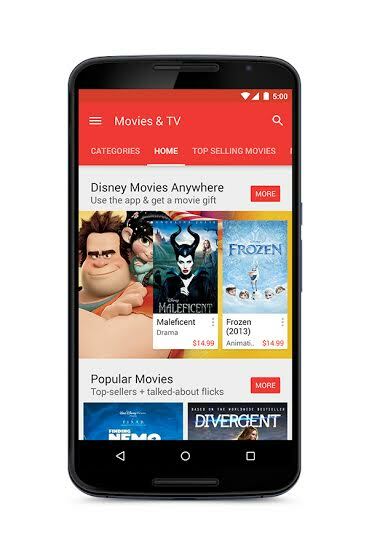 Disney and Google have teamed up to let you watch Disney, Pixar and Marvel movies on any device via Google Play. “We want to make it easy for movie fans to enjoy all of their past and future digital purchases across all of their devices,” says Google’s head of Google Play Movies partnerships Jonathan Zepp. Disney has some deep roots with Pixar and had originally rolled out the Disney Movies Anywhere initiative with Apple in February. That initiative allowed people to purchase and then sync up Disney movies on iTunes or upload a special code from physical DVD’s and play them on Apple products. Now Disney, Pixar and Marvel fans will be able to pick up any tablet, computer or smartphone regardless if it’s Android or iOS and play the 450 movies offered on any device. Just like with the iTunes deal, one simply needs to download the Disney Movies Anywhere app and connect to your Google account. The content you purchase on iTunes, Google Play or the DMA platform will then exist in all three places. The partnership makes a lot of sense for Disney here. This allows it to truly offer its movie catalogue on any OS platform. Android now accounts for over 50 percent of market share in the U.S. and Google Play goes right along with it, according to the most recent ComScore report. That also makes this the first time we’ve ever been able to get content to sync up and play nice on any device from several different tech platforms. It’s like MGM studios agreeing to partner with both Netflix and Amazon and then guaranteeing that no matter what, the movies you buy will exist on both Netflix and Amazon. That hasn’t happened, of course, but this is a strong step forward in the future of movie purchases. This also marks a significant shift for the entertainment industry. Families are much more likely to own multiple devices and are less likely than even a few years ago to go see a movie in the theater. The Motion Picture Association of America reported a slight increase in sales from 2012 to 2013. Movie purchases went from $10.8 to $10.9 billion, but this was because ticket prices increased, not because we were going to the movies more. A Harris Interactive poll out at the beginning of the year shows people from both genders and in every age group now prefer watching movies at home over the theater. Add to that the MPAA report mentioned above which also showed frequent movie watchers tend to own multiple devices on which they can play content such as movies. While playing movies on DVD or BlueRay is still the most preferred, about 16 percent of Harris Poll respondents ages 18-36 said they would rather purchase streaming movies via iTunes or Amazon. Some of that may be due to fear of losing your movie purchase if it’s just on one platform. Platforms and technologies change. It’s still too easy to lose all your purchases, should something happen within that platform. I’d personally rather rent a movie and purchase a physical copy myself. However, giving folks access to their movies on several platforms increases the likelihood they’ll be able to keep and access their purchases no matter what. Disney Studios CTO, Jamie Voris told me that even if something should happen with the Apple partnership, families would still be able to get their content on the DMA site or with Google Play. That’s even if they originally purchased it on iTunes. Voris says Disney Studios had their eye on Google as a partner for awhile but they had to make sure the technology worked before releasing this to the public. He also hinted that there would be another partnership announcement coming soon, though he smiled and told me he couldn’t say but I’d be very pleased with the next partnership when I pressed him further. I’d mentioned Amazon movies earlier so my bet is on that. Disney is offering “Wreck It Ralph” for a limited time to anyone who connects to one of their partner accounts, whether it be iTunes or Google Play. The DMA App is available on the Google Play store at http://di.sn/fxx or from the iTunes App Store at: http://di.sn/srf.